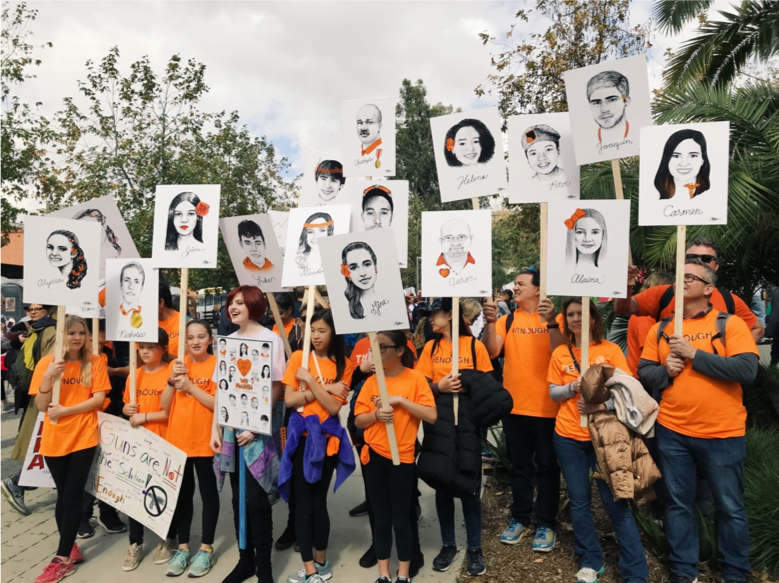 This is part two of First Focus’ March for Our Lives series. Check out part one. 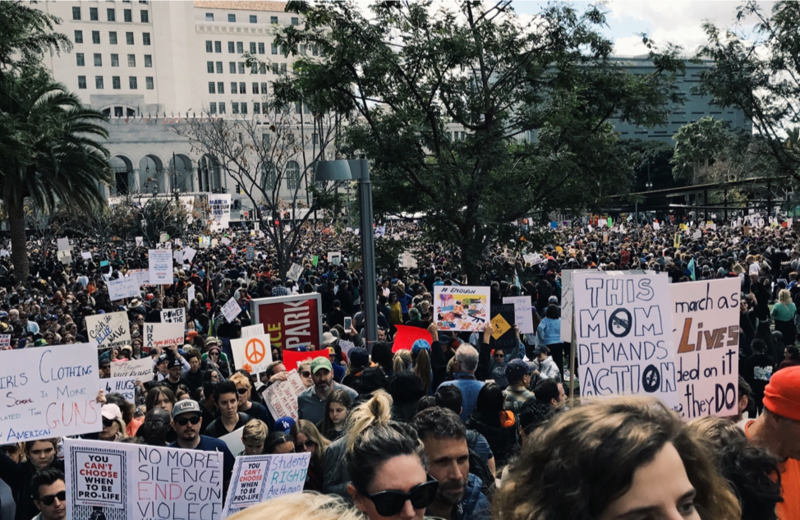 History was made this past Saturday as millions marched in cities around the world, standing in solidarity to prevent more innocent lives from being lost to gun violence and pushing Congress to act on comprehensive gun reform. 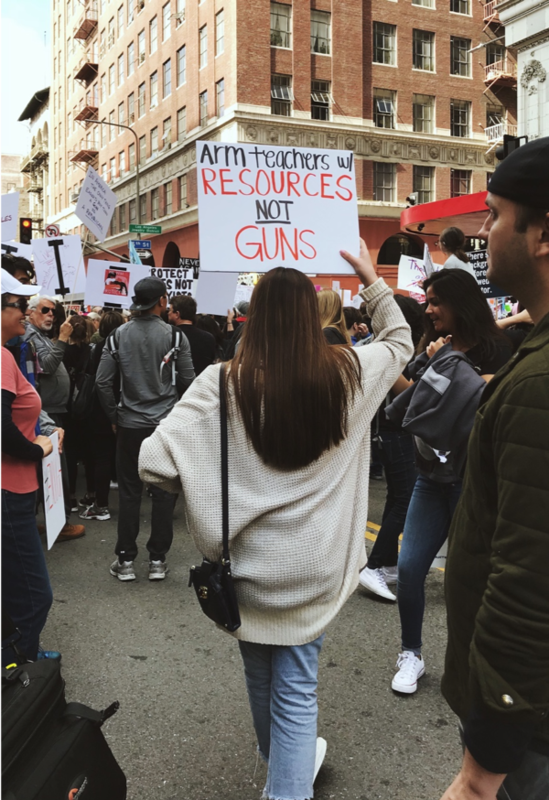 Each person participating in the March for Our Lives had a unique experience, but all were bound together by an ultimate desire to see change. 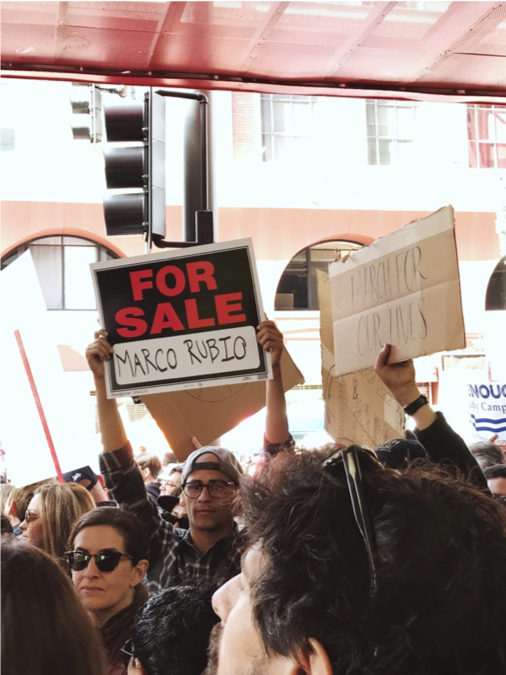 The Diamondback reporter Allison “Ally” O’Reilly was in the field in the Washington, D.C., march and First Focus’ Giselle Miranda was across the country to march in Los Angeles. When I arrived at the march, camera dangling from my neck and phone poised for potential interviews, my first instinct was to scan the crowd. The march had an overwhelming ambiance of hope and togetherness. The weather was warm and bright, there was music and chatter everywhere and almost everyone was there with the same purpose. There were a lot of speakers at the event who shared their experiences with gun violence. Though their stories were sad at their core, each of them expressed and exuded hopefulness as they spoke out loud to a crowd of over half a million people. 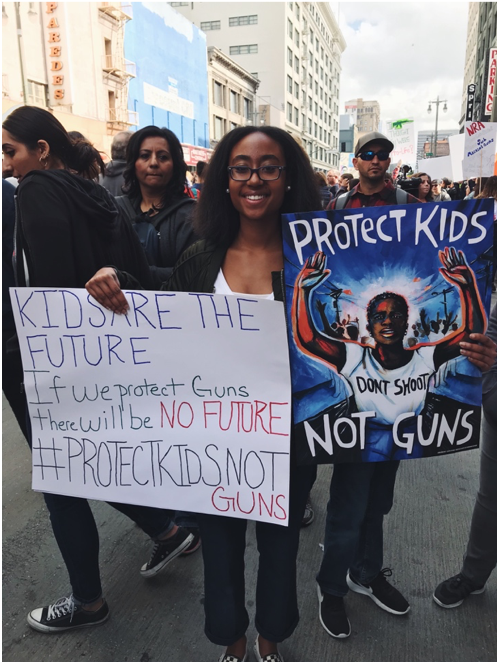 An 11-year-old girl named Naomi Wadler gave an impassioned speech about gun violence disproportionately impacts black women and girls. She noted that she and her classmates will be voting in seven years, which served as a reminder to politicians that these student leaders should be taken seriously as they will yield their political power as soon as they turn 18. 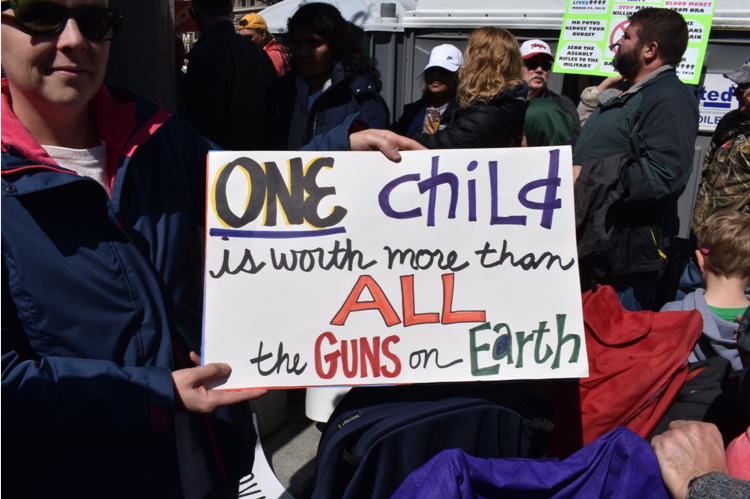 As powerful speeches boomed in the background, I approached a man and woman with a stroller holding a sign that read “one child is worth more than all the guns on earth.” The woman was Katie Ryder, 35, who was present with her husband and three kids — a seven-month-old, a two-year-old and a six-year-old. 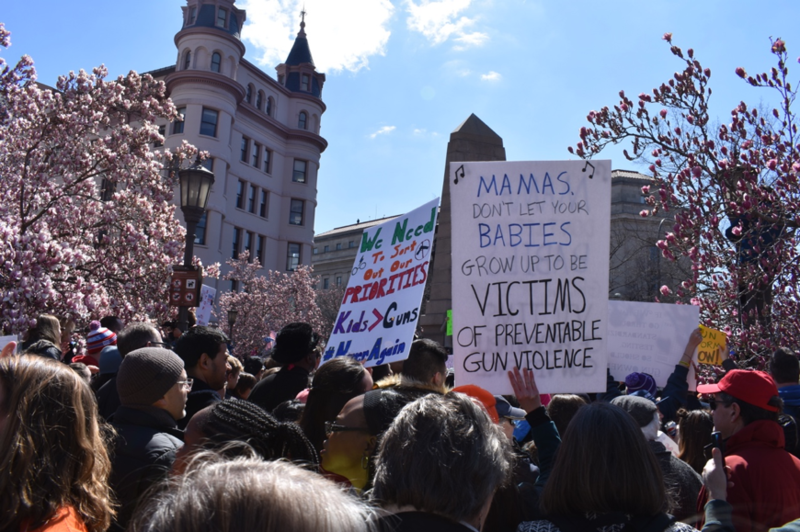 The march was not one of sorrow or harping on the past, it was instead a display of hope from individuals who have seen so much pain but look toward so much change. These protesters have seen the damage done by countless mass shootings and instead of cowering in fear they stood up and marched on Pennsylvania Avenue — sending a message of adamancy to their representatives in Congress. Among the most unifying moments of the day was during Miley Cyrus’ performance of her 2009 classic The Climb. It seemed as though all 500,000-or-so marchers knew every inspiring lyric and were singing along. Hearing a crowd of mostly young people, fighting for a cause they believe in so deeply, sing the lyrics “The struggles I’m facing, the chances I’m taking / Sometimes might knock me down, but no, I’m not breaking / I may not know it, but these are the moments / That I’m gonna remember most, yeah / Just gotta keep goin’” was emotional — and truly emblematic of the whole afternoon. 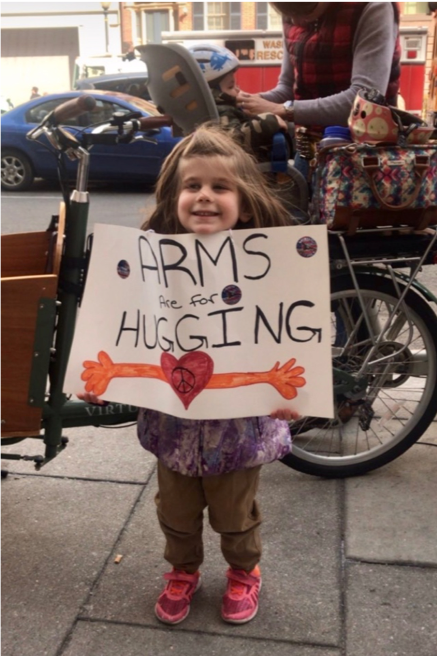 I woke up on Saturday morning with a jolt of excitement, an excitement that only grew stronger as I checked my phone that buzzed every few minutes with news alert headlines announcing the overwhelming size of the D.C. march. “There are 800,000 people marching in DC! Can you believe it!? !” I exclaimed to my boyfriend as we got into our Uber. 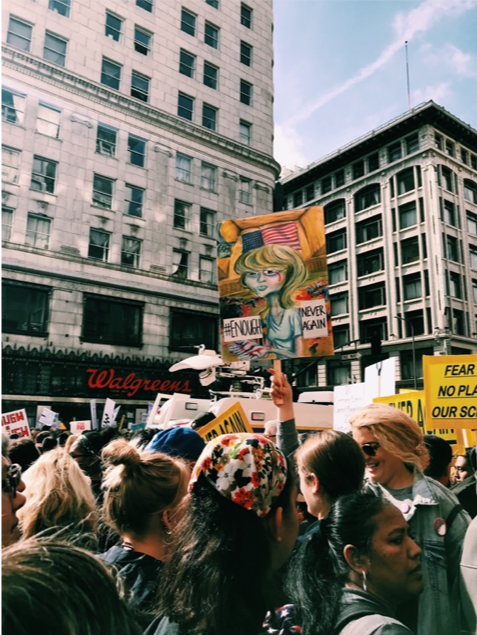 Arriving in downtown LA, we were greeted by a sea of people holding colorful signs, music, and amplified voices shouting their words into a microphone for all to hear. The energy, similar to what Ally experienced in DC, was hopeful and filled with raw emotion. As someone with a keen interest in photography, I wanted to capture every moment of my experience through pictures. A peaceful crowd moving in two opposite directions. You would think this could get chaotic, but whenever we bumped each other we all just smiled and kept moving. After all, we were all there in support of one another. Earlier last month Marco Rubio dodged Parkland survivor Cameron Kasky’s question regarding whether he’d accept more campaign money from the NRA. The President, alongside others, believes arming teachers with guns and installing metal detectors in schools will end mass school-shootings. In reality, there exists little evidence demonstrates that these changes—already implemented in some schools—lead to meaningful impacts on school safety. 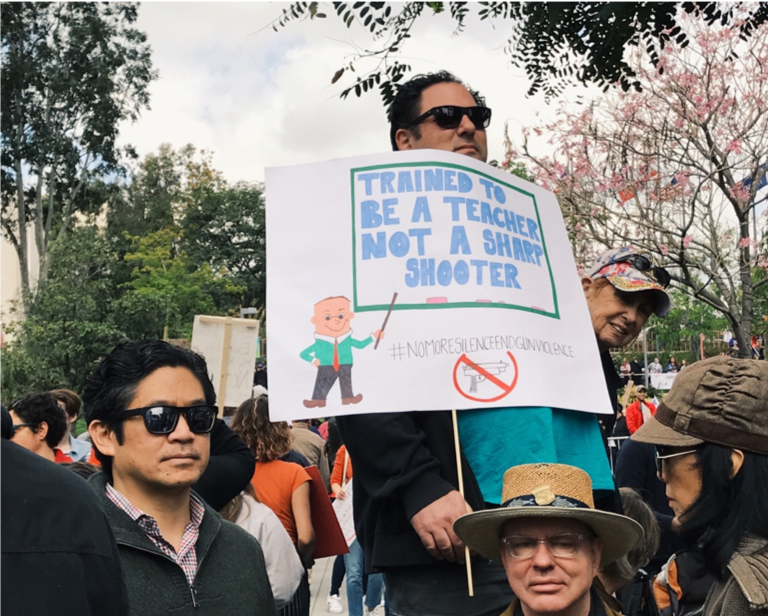 How can the federal government afford to arm teachers with guns when it continuously underfunds K-12 public school programs and school infrastructure? Remember: Communities of colors are disproportionately affected by gun violence. 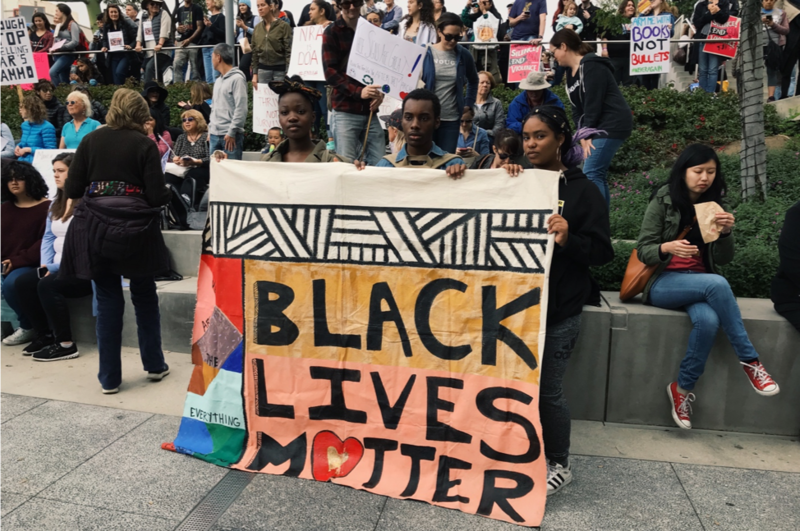 Black students make up 16.6 percent of the school population, but they experience school shootings at twice the rate of white students. 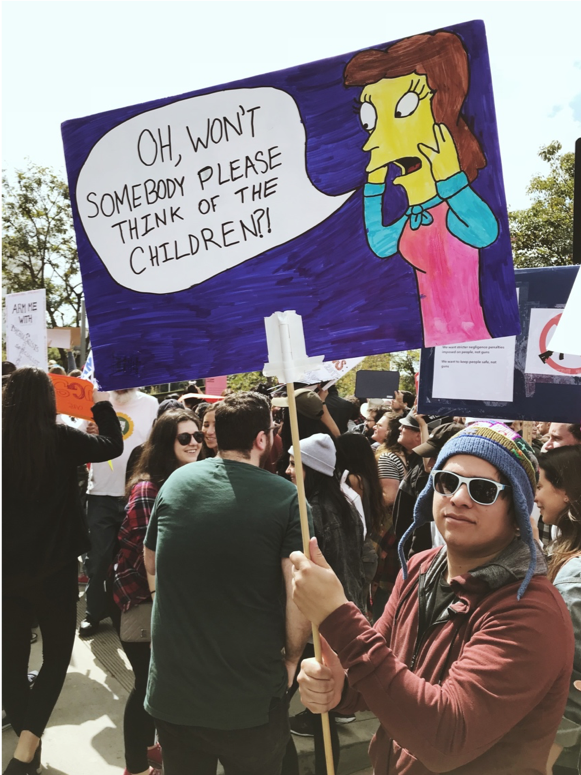 Children and young adults of all ages joined together at the march to voice their opinions. 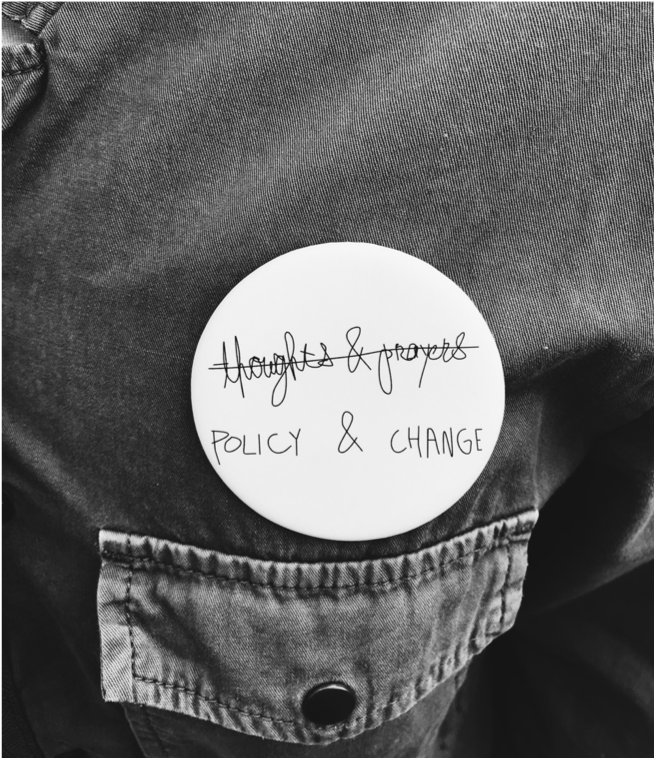 This youth advocacy, similar to the student-led protests during the Civil Rights-era, filled me with a surge of optimism and reassured me that change is inevitable. After a day of being behind the camera capturing critical moments, I turned around one last time as I left the march only to be sent into a state of awe at just how many people were at the march. And from that, I got this last shot. Special thanks to Ally O’Reilly for contributing to the Voices for Kids blog. She is a journalist and writes for the University of Maryland’s student-led newspaper, The Diamondback. See more of her coverage on the march.